Whenever I experiment with a new vegetable recipe, I always think back to dinner time as a child and being forced to eat asparagus or broccoli, and hating them. Now I love vegetables. I have learned that enjoying vegetables has a lot to do with freshness and how they are prepared. And let’s not forget variety. Trying new things can keep our taste buds interested. Recently, my husband and I joined a local food co-operative. It is a small grocery store that offers fruits and veggies from local growers, and has an amazing variety of fresh offerings. As I strolled through the rows of vegetables, I stopped to look at the variety of squash available. I have eaten a lot of zucchini in my time; fried, sauteed, baked in muffins and cake, and so on. But I saw this unusually shaped, light orange colored squash and stopped to see what it was called. Butternut squash. I had heard the name many times before, but I had never attempted to try to cook with it. Ripe for adventure, I selected a 3 pound butternut squash and left the store ready to attempt a new recipe. I decided that with fall coming I would start by making a butternut squash soup. I love soups in the fall and winter. On a cold day, there is nothing better. 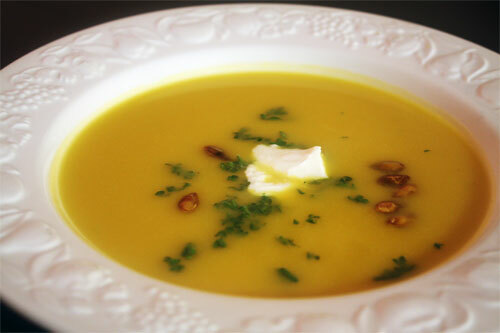 I was surprised at just how easy the squash was to work with, and how easy the soup was to make. Soup in general can be an easy dish to make, but the recipe I used was simple to follow and tasted delicious. The squash had a thin skin, that when baked separated very easily from the flesh of the squash. The soup recipe that I used only called for a handful of ingredients and took less than an 2 hours to make, start to finish. 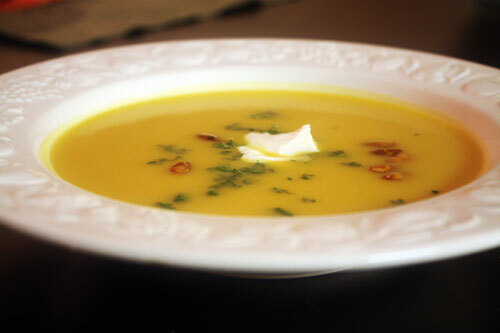 The flavor of the squash was sweet, but the leeks in the recipe countered the sweetness in just the right amounts. The result was a smooth, mildly sweet and enjoyable soup. My husband and I found ourselves going back for seconds. 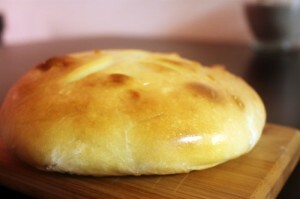 Fueled by the success of the soup, I decided to attempt homemade bread as well to accompany the soup in the future. My attempt at homemade bread, made completely by hand, did not go as smoothly as the soup. What I have learned in my recent trials of bread making is that it isn’t always that easy. There can be many factors, especially when working with yeast. Which is what happened to me, my bread didn’t rise properly. I”m guessing it had a lot to do with the humidity and the hot weather on the day that I made the bread. But I’m not deterred, the flavors are well worth the effort. I am however warming up to the idea of using a bread maker. I tend to error on the side of doing things the old fashioned way, but when I saw how easy it was for my Mom to simply add ingredients to her bread maker and walk away, I was intrigued. And the bread it produced tasted wonderful. I haven’t given up on the handmade bread, but I am seeing the value of using a bread maker, especially when time counts. I am excited about continuing to experiment with squash, the possibilities are endless, everything from soups to ravioli filling and Thanksgiving side dishes. I am so glad that we outgrow our distaste of some vegetables. Trying new things makes cooking and enjoying food more of an adventure. And hopefully with time my bread making will improve too. For now I can take pride eating my veggies, without being told. Preheat the oven to 400 degrees F. Place the squash halves cut side down on an oiled baking sheet. Toss the seeds of the squash lightly in olive oil and place alongside the squash on the baking sheet. Bake the squash for 45 minutes to 1 hour, until the squash can be easily pierced with a fork. Let the squash cool, then scoop the pulp from the skin into a medium sized bowl. In a soup pot on the stove, melt the butter on medium heat. Add the chopped leeks to the pot and stir until tender but not brown, about 10 minutes. Add the squash and chicken stock to the pot and stir to break up the squash. Bring to a simmer for 20 minutes. Remove the mixture from the pot and puree with a blender until smooth. Note: depending on your blender you may need to do this in 2 batches. Return the blended mixture to the pot and stir in 2 cups of water and the salt. Heat through and then serve warm. To serve: garnish with parsley, toasted seeds and a dollop of Greek yogurt. Squash, fruits of various members of the gourd family, are found in two varietals, summer and winter. But do not let the name fool you. The terms “summer” and “winter” refer to the seasons in which they are enjoyed, not when they are available. Winter squash can actually be found in markets in late summer through the winter. Summer squash can usually be found year round, including the winter. Winter squash does take longer to mature than summer squash, about 3 months or more. They are best harvested in the fall and can be stored for months in cool conditions, which is why they came to be popular for winter consumption. Place whole winter squash on top of thick pads of newspapers in a cool (40-50 degrees F.), dry, well-ventilated location. Check every few weeks to check for rot, and use within three to six months. Cooked squash, steamed or baked, it can be stored frozen until needed. Try to find squash that feels heavy for its size and has hard, deep-colored skin free from blemishes. The more orange the Butternut squash for example, the sweeter it will be. All varieties are great for puréeing, roasting and baking. 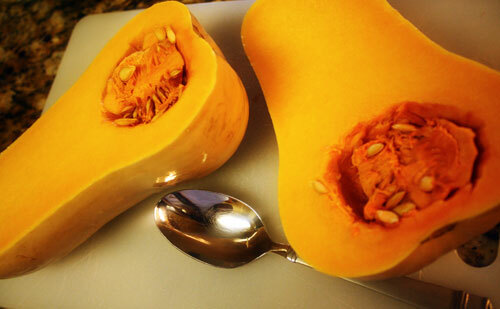 Cooked squash can be used in soups, main dishes, side dishes, even breads, muffins, and pies. Winter squash matures on the vine and develops an inedible, thick, hard rind and tough seeds. Winter squash can be cut in halves or pieces. The seeds should be removed before baking. Butternut squash is a species of winter squash that grows on a vine. It often is compared to pumpkin for its sweet and nutty flavor. It has yellowish colored skin and orange fleshy pulp. When it is ripe, it turns more orange, and is sweeter and richer. In addition to the flavor rewards, it also is rich in vitamins. It is a good source of fiber, vitamin C, manganese, magnesium, and potassium. It is also an excellent source of vitamin A. Looks delicous. Now that fall is in the air (finally) I’m going to give your recipe a try! let me know how it goes! I’m also experimenting with some pumpkin recipes this month too, stay tuned! I made your recipe two weeks ago and loved it. I have another butternut squash waiting on my counter right now, so Eric’s going to be getting a repeat here soon. After I pureed the soup in the food processor, I didn’t add any extra water because it seemed like a great consistency, as-is. I also used fresh ginger, which turned out to be a mistake (the pieces of minced ginger somehow escaped the processor blades and would end up at the bottoms of the soup bowls. Not a big deal if you like ginger, but I’m not a huge ginger fan, so I had to pick them out). I just made a batch of homemade vegetable stock and can’t wait to try the recipe with that instead of the little bullion cubes I usually use.